Welcome to the new, interactive and innovative trade and consulting platform www.Balticgoods.com for the products and services from the Baltic Sea region. And for your start into new west europe markets. In 2013, about 107 billion euros have been implemented in the interactive trade in England. 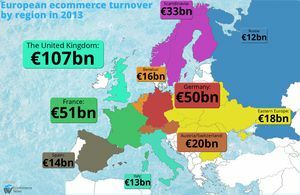 In Germany -50 billion, Scandinavia -33 billion, -12 billion Russia, France -51 billion, Spain -14 billion, Eastern Europe -18 billion. The forecasts for 2014 and 2015 are still rising. To remain successful and competitive in the future, it is impossible to ignore the topic of e-commerce. For most sectors this is almost normal, even the smallest business in the pedestrian zone is open 24 hours through an online store. Those who are concerned with the purchase of the products and services from the Baltic Sea region will be quicklydisappointed trying to research online. There is only a small range of products in malfunctioned online shops. Mostly because of the following reasons, it is complicated, time intensive and expensive. We offer an affordable solution that is fair to all interested parties. We are looking forward to receiving your inquiry by mail.